Throughout the Commonwealth realms, the Loyal Toast is most commonly composed solely of the words "The Queen" or "The King" (as appropriate), though this may be elaborated with mention of the monarch's position as head of a particular state, such as in Canada, where the Department of National Defence codifies the Loyal Toast as "Ladies and gentlemen, the Queen of Canada." If the sovereign holds an honorary position within a Canadian Forces regiment, in that regiment's mess the toast is: "Ladies and gentlemen, the Queen of Canada, our Captain-General," or whatever rank the monarch may hold. As Queen Elizabeth II is recognized as the symbolic head of the Commonwealth of Nations, at any event where the guest of honour is a dignitary from any of the 16 Commonwealth realms, the Loyal Toast is adapted to be "Ladies and gentlemen, The Queen, Head of the Commonwealth," and should an honoured guest be from one of the other Commonwealth member-states, the Loyal Toast is to be recited as "Ladies and gentlemen, the Queen of Canada, Head of the Commonwealth." Other unique cases exist in places such as Lancashire, where the salute may be "Ladies and gentlemen, The Queen, Duke of Lancaster"; in Jersey and Guernsey, where residents will informally say "La reine, notre duc" ("The Queen, our Duke"); on the Isle of Man, where "The Queen, Lord of Mann," is said; and in Cornwall where it is traditional to toast "The Queen and The Duke of Cornwall". Members of the Royal Family neither participate in nor respond to the Loyal Toast, and the honour may be followed by a playing of "God Save The Queen", which is either the national and/or Royal Anthem of most Commonwealth realms. When ambassadors or similarly senior representatives of other heads of state are present, it has become customary for a toast to be proposed after the Loyal Toast to "heads of state of other countries here represented." The toast can be adapted for use at some royal foundations. For example, at Christ Church, the first toast is always "The Queen, Visitor of Christ Church." Official etiquette dictates that the Loyal Toast may be given following either the introduction of honoured guests and opening remarks or the completion of all courses of the meal, that it be the first toast given, and that a glass of any beverage other than a cocktail be used. It is also customary not to smoke until the sovereign has been toasted. In carrying out the toast, the event's host will rise and request the audience's attention. Once accomplished and the guests are standing, the host raises his or her glass and recites the toast without any other words or music. The audience then responds to the toast by repeating "The Queen" or, in Canada, "La reine", drinking the toast, and seating themselves once more. In the Royal Navy, however, the toast is given with all attendees seated, a custom practised since King William IV, who had served as a naval officer and experienced the discomfort of standing suddenly on board a vessel at sea, authorized all in the navy to toast him while sitting down. This practice is also carried out on board the ships of the Royal Canadian Navy, so long as neither The Queen nor any other member of the Canadian Royal Family is present, in which case the toast is given while sitting only if the royal guest so requests it. In the British Army several units have special privileges and are exempted from the usual practice of standing up for the toast. For example, the Royal Scots Dragoon Guards are allowed to remain seated while the Queen's Royal Hussars do not drink the toast at all. The Loyal Toast was the catalyst for international friction in 1948, when the Taoiseach (prime minister) of Ireland, then John A. Costello, made an official visit to Canada. There, at a formal function, Governor-General of Canada The Earl Alexander of Tunis steadfastly refused the directions of Irish officials to toast the President of Ireland, Seán T. O'Kelly, instead of the Irish king, George VI; at the time, the King fulfilled the external affairs role that normally belongs to heads of state, while the President of Ireland fulfilled an internal constitutional role. An irked Costello stated to a reporter the following day that he would prompt the Irish parliament to repeal the Executive Authority Act and declare Ireland as a republic, which was done later that year. In 2000, Captain Aralt Mac Giolla Chainnigh, a professor at the Royal Military College of Canada, petitioned to be personally excused from, amongst other displays of loyalty, having to stand and participate in the Loyal Toast. The Canadian Forces Grievance Board, the Chief of the Defence Staff, and the Federal Court of Canada all upheld the Canadian Forces' requirements that members respect the Canadian head of state and Commander-in-Chief. In Scottish Jacobite circles special very fine glassware engraved with Jacobite symbols was made to toast Charles Edward Stuart, known as Bonnie Prince Charlie, the pretender to the thrones of England, Scotland, France, and Ireland; very little remains due to the tradition of smashing glasses after the toast so that they could not be used for a lesser toast. After the defeat of the Jacobites and the exile overseas of Bonnie Prince Charlie, Jacobite Scots would stand for the loyal toast to "the King" but pass their drink over a glass or jug of water on the table symbolising "the king over the water" instead of the British monarch, as a sign of solidarity with the Jacobite cause and a protest against the Hanoverian succession. Because of this for many years finger bowls were not used on British royal tables, as some people would pass the glass over the bowl. King Edward VII authorized the use of finger bowls during his reign, deeming his dynasty to be sufficiently secure. At formal occasions in the Spanish Armed Forces, the first toast is to the King of Spain. The highest-ranked officer toasts "Por el primer soldado de España" ("For Spain's first soldier") and the concurrence answers "Por el Rey" ("For the King"). At the Nobel Banquet or other such formal events in Sweden, the first toast is usually to the Swedish sovereign. It is proclaimed by the host or, if the host is the monarch himself, the second-highest-ranking official. It is simply "Hans Majestät Konungens skål" ("The toast of His Majesty the King"). All guests then rise, raise their glasses, and, if the sovereign is present, turn towards him and answer "Konungen" ("The King"). 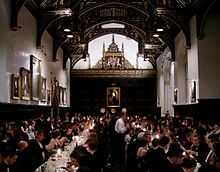 In wardrooms and officer's messes during formal dinners, the Royal Hymn can be sung after the Loyal Toast, even when the king is not present. At formal military social occasions, the first toast is traditionally to "the President of the United States," as he is commander in chief of U.S. armed forces. ^ "The Loyal Toast, Official Functions, Hierarchies, Forms Of Address, People of Influence". Debretts.com. Archived from the original on 7 March 2016. Retrieved 3 May 2016. Protocol of the loyal toast at UK official functions. ^ a b Mairead McKerracher (30 June 2012). Jacobite Dictionary. Neil Wilson Publishing. pp. 106–. ISBN 978-1-906000-25-7. Entry on "Jacobite glass", specially made for drinking toasts; very little remains, due to the tradition of smashing glasses after the loyal toast. ^ "The Loyal Toast". Debrett's. Archived from the original on 4 February 2014. ^ Parliamentary Debates, House of Commons Official Report, Standing Committees Session 1972-73, Volume VI, H.M. Stationery Office. ^ a b "Toast to the Queen". Halifax Burns Club. Retrieved 6 November 2014. ^ Aralt Mac Giolla Chainnigh v. The Attorney General of Canada , T-1809-06 The Honourable Mr. Justice Barnes, 14.5 (Federal Court of Canada 21 January 2008). ^ Holt, Mack (2006). Alcohol: A Social and Cultural History. New York: Berg. p. 184. ISBN 978-1-84520-166-1. ^ Michie, A. God Save The Queen. p. [page needed]. This page was last edited on 30 March 2019, at 19:16 (UTC).